Epsons compact, four-color C3500 inkjet printer features fast printing speeds up to 4 inches/second, a banding reduction mode and a nozzle check system that produces a reliable output of high volume labels with excellent image quality. In addition, it offers multiple easy-to-use features such as an auto-cutter, easy paper loading and an LCD with printer status readouts. 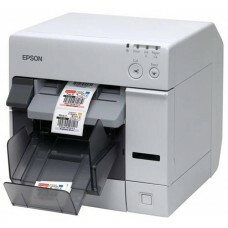 Epson TM-C3500 Color Label Printer, Nice Label, Multicoloured, USB, Ethernet, cutter, display, incl. : power supply unit, ink cartridge, order separately: interface cable, power cable, colour: white.